Introducing Sound-Waves. A revolution in bathroom audio. 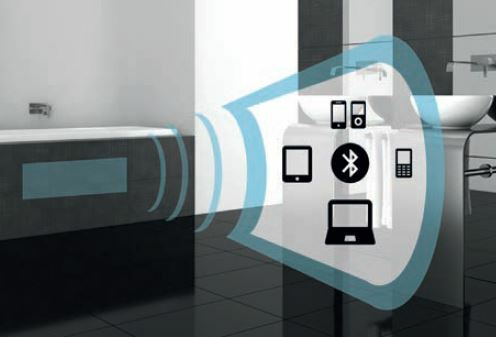 Utilising advanced Blue-Tooth technology, Sound-Waves allows you to enjoy your favourite music whilst relaxing in the comfort of your bath. No need for docking stations, earphones, cables or even speakers! Sound-Waves turns any acrylic bath into a highly refined stereo speaker. Whilst the concept may well be staggering, the truly amazing part is the wonderful audio reproduction created by this stunning product. Operation couldn’t be easier. Simply pair your Blue-Tooth enabled device with Sound-Waves, select your desired playlist and relax as you immerse yourself in the comfort of your audio accompanied bath. Chromatherapy is the therapeutic use of colour to promote balance and healing in mind and body. Choose a colour to reflect your mood or to change how you are feeling. 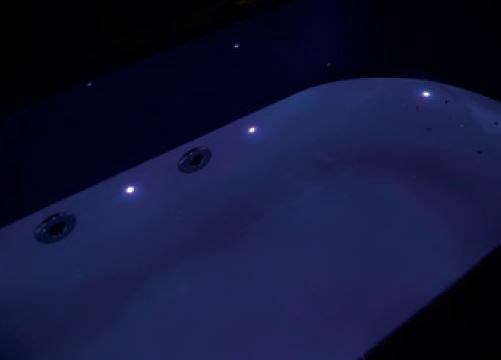 Lighting adds a special atmospheric addition to the hydrotherapy bathing experience providing micro lights on the waters level around the bath itself, combined with the air-spa, whirlpool or both delivers the ultimate hydrotherapy experience. Blue a relaxing colour associated with knowledge. Red is energising and violet spiritual promoting enlightenment. Green is calming with orange promoting enthusiasm and pleasure. Change to the fade programme and allow the colours to gently scroll from one to the next, enhanced by the water as a lens, either still water, or the colours refracted through the whirlpools champagne bubbles. 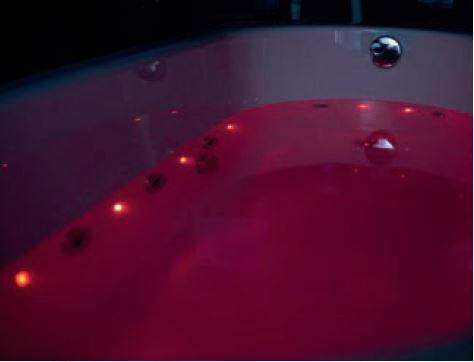 Lighting within a hydrotherapy experience has a positive influence on autistic /handicapped children and young adults, the lighting therapy as it rolls through the seven colours of chromotherapy along with the airspa action in the water provides a beneficial sensory experience.